It looks like Nvidia has finally spoken officially about Mantle. And turns out that they think that Mantle is basically useless (for Geforce GPUs) and there is no sense in supporting it. This is probably one of the most painstakingly obvious PR reports I am going to make. There was just no way Nvidia would end up supporting Mantle, regardless of the fact whether Mantle could or could not have been of use to them. The sheer rivalry and competitive nature of their relationship just would not have permitted this to happen. “We don’t know much about Mantle, we are not part of Mantle. And clearly if they see value there they should go for it. And if they can convince game developers to go for it, go for it. It’s not an Nvidia thing. The key thing is to develop great technologies that deliver benefits to gamers. Now in the case of Mantle it’s not so clear to me that there is a lot of obvious benefits there.” – Tom Petersen & Rev Lebaradian. Basically Nvidia stated that if you take a look at their recent driver updates you will notice almost no performance difference between the new drivers and Mantle API in configurations that matter which is possibly a reference to the fact that extreme amounts of CPU Overhead is rare (e.g: coupling an i3 with a GTX 780 Ti SLI). They are of course referring to the wonder drivers that matched Mantle’s performance increases on the DX11 (something I released criticism on too) which was quite an achievement. The problem is that, nearly every other game is optimized differently so it becomes very hard to distinguish between an API’s Low Level Optimization and just plain old driver optimization. The end result is that the battle becomes blurred and the stage remains unchanged. 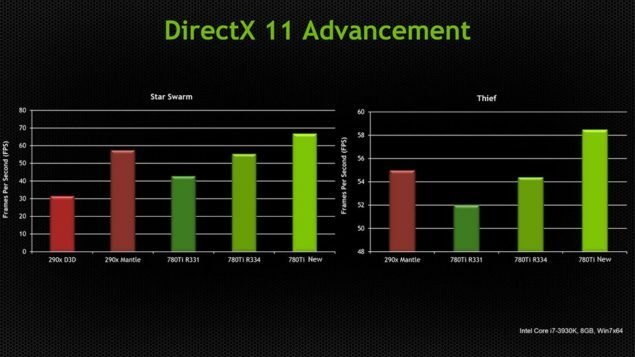 Nvidia of course mentions the same argument, that there is performance yet unearthed in the DX11 API and finally raises the end game that anything Mantle gives, DX12 will too, so they won’t adapt it. Rationally speaking there was just no way Nvidia was going to adapt Mantle, not with DX12 providing the same level of Low Level optimization at any rate. The thing is, while I enjoy the competition between both Red and Green, corporate ego is undeniably there. And that is something that will never change. I am pretty sure AMD will never adapt G-Sync (AMD is currently working on Free Sync) and its not because its expensive (B2B transactions don’t work this way) but there is nothing wrong with that. Because at the end of the road, it is this fierce rivalry between companies that gets us gamers and enthusiasts true innovation.